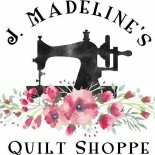 Join the Foundation Paper Piecing fans of J Madeline’s for the third of twelve blocks completed with paper piecing. We will be using the Kimberbell book, Sew It by Number: Paper-Piecing Throughout the Year. (This book is required for the class.) 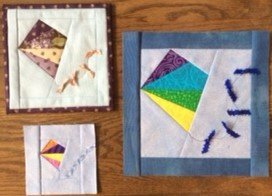 If you are familiar with the basics of foundation paper piecing, you will be able to complete these beautiful blocks! The photo shows all three size options. The intent of the class will be for each participant to create one. If you are familiar with paper piecing, you should be able to complete more. Feel free to bring an additional project to work on if you finish this month's block early! Finished project options include wall hangings, lap quilts, mug rugs, pot holders, pin cushions, table runners, or some of all of the above. We will be meeting on one Tuesday evening or one Saturday morning all year. Sign up for just the months you like, or join us all year (separate sign up for each month). Requirements: Please see link listed on course details. The Kimberbell book, "Piece it by Number: Paper-Piecing Throughout the Year" is required for this class. Instructor Bio: Jane Beamish is a teacher in everyday life. Her quilting journey started in 4-H with a 1970s Sunbonnet Sue pillow (still in her house). Somewhere along the way, she fell into foundation paper piecing and never wanted to get out. Jane's goal in life is to demystify paper piecing and promote its reputation as an enjoyable piecing technique. Jane can sign for Deaf participants with no prior notice needed.